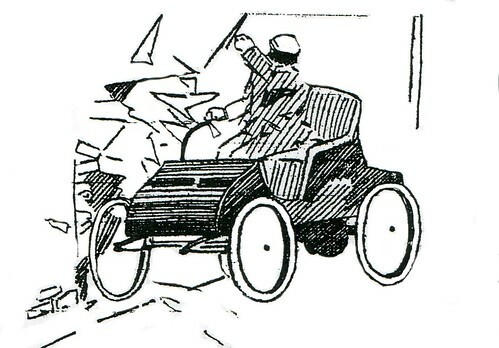 A sketch of one of Joplin's early car accidents. The unfortunate driver was Gus Mattes who had attempted to drive the vehicle into Webb’s shop but instead failed to slow down and completely missed the entrance, but did not miss the brick wall (“with great force.”) Surprisingly, despite the fact that Webb’s shop had suffered damage described alternatively as “demolished” and “splintered” the actual automobile received only a “crack in the glass of one of the lamps.” Before the day was done, the shop was already under repair, and undoubtedly, Mr. Mattes’ vehicle as well. Incidentally, A.C. Webb’s shop was only a few blocks away from the Joplin Fire Department. When Joplin firemen responded to a fire a couple years later behind a steering wheel, its creator was Webb. This page took 0.265 seconds of computer labor to produce.